My first idea was the 40mm with arabic numbers, date and Top 2824-2 movement. Then I started thinking about getting the manual wind movement, as I don't have any in my collection. I had a Speedmaster double sapphire glass and it wasn't very comfortalbe to wind it. I also missed many times the date in that watch. It seems that the Marine crown is quite more comfortable to use than the Speedmaster one, so I'm almost decided to try the manual movement. Now I'm with the size too. I have thin wrists: 6.3". My usual watch sizes is between 40 and 42mm, so 40mm appeared fine to me. But I see many pictures with 36mm and it looks bigger. Maybe the white dial bazeless combo makes that effect, but I'm not sure. I'm wearing right now a Hamilton Khaki Field 42mm with black dial. I guess it's a quite similar case design. I noticed it has different hands design too. Any advise? I now it's something very personal, but may be reading others opinions may help. I have the same watch and same size wrist--here are a couple of pics. The size is the outer limit of acceptability for me, and even still I prefer to wear it with long sleeves. There is no lug overhang on my wrist, but the dial alone measures 36mm, so it wears big. If I could get the silver dial, brushed case, and old logo on a 36mm watch I'd own that one instead. I can't buy that watch, so I'm perfectly happy with the 40mm version. It's not a dress watch, so I'm ok with the size as a dressy/casual watch. DiegoF and miquel99 like this. For me a "marine chronometer"/deck style watch shouldn't have a date, but it's your watch, do what you like. Also for your wrist size I would max out at 40mm and generally wear smaller, especially with white faced watches which wear big, but it really is a personal style thing. Imho you'd be throwing money down the drain if you get the upgraded bits and pieces for the Stowa. I think the base model would be fine just the way it is (date or no). 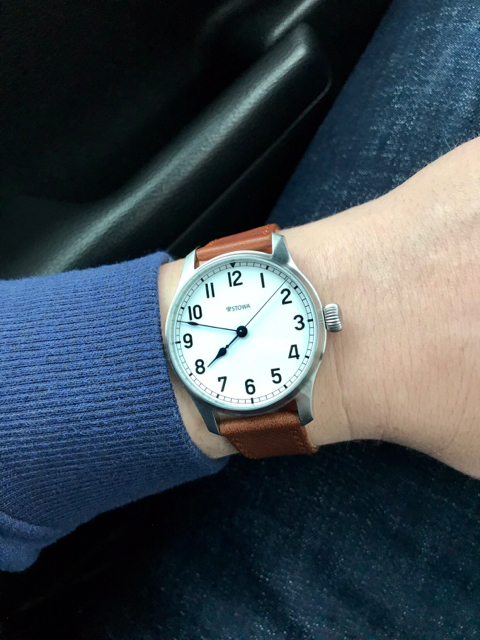 I do like the Stowa and think it is a solid choice. Steinhart - do not like at all. Personally I would save and get a D. Dornbleuth 99.X/2010 but it's many times the price. I think they have a better quality and more interesting product but more importantly I think the markers/track make for a more balanced dial and more carefully font chosen gives it a more classic feeling whereas the Stowa is a little too modern in the font for my tastes. Another option I really like and in a similar style and price to the Stowa is the Smiths PRS-29AM which though smaller at 36mm, and has its own military history background. Plus it has the logo which cannot be unseen. I prefer the Dornblüth font too, and the overall quality of that watch is at another level obviously (at much greater cost). The Stowa font, however, is not modern. I believe it's the same font used on their vintage pocket watch from the '30s or '40s. I'm sure someone can post a pic. DiegoF and mapurisa like this. That looks great. I think I’ll go for the 40mm. Did the strap have the right size for your wrist? I’m not sure about the date option. It just looks so clean without it. I guess it has fast date change at least. I have a Navitimer that doesn’t and if you have to move many days it’s tedious. About the extra options, I’m almost sure of choosing the manual winding. I know I can save money choosing the basic ETA, but it would be something more special with a manual winding I think. The Dornblüth looks really great, but if I’d spend that amount of money, I’d try to get a IWC Portuguese, that is the one I like most. After watching several pictures -there are a lot in Instagram- I’m finally decided by the 36mm, arabic numbers, no date, manual winding option. I see the 36mm is the most sold as the delivery is end of May, whilst the 40mm is 2-3 weeks. Congratulations Diego, its a very special watch!! Congrats great choice, I just got the 40mm ..